Remove excess fat from chicken. In Dutch oven or stock pot, place chicken, giblets (except liver) and neck. Add remaining chicken and broth ingredients; heat to boiling. Skim foam from broth; reduce heat to low. Cover and simmer about 45 minutes or until juice of chicken is no longer pink when centers of thickest pieces are cut. Remove chicken from broth. Cool chicken about 10 minutes or just until cool enough to handle. Strain broth through cheesecloth-lined strainer; discard vegetables. Remove skin and bones from chicken. Cut chicken into 1/2-inch pieces. Skim and discard fat from broth. Use immediately, or cover and refrigerate broth and chicken in separate containers up to 24 hours or freeze for future use. Add enough water to broth to measure 5 cups. In Dutch oven, heat broth, sliced carrots, sliced celery, chopped onion and bouillon granules to boiling. Reduce heat to low; cover and simmer about 15 minutes or until carrots are tender. Stir in noodles and chicken. Heat to boiling. Reduce heat to low; simmer uncovered 7 to 10 minutes or until noodles are tender, stirring occasionally. Sprinkle with parsley. 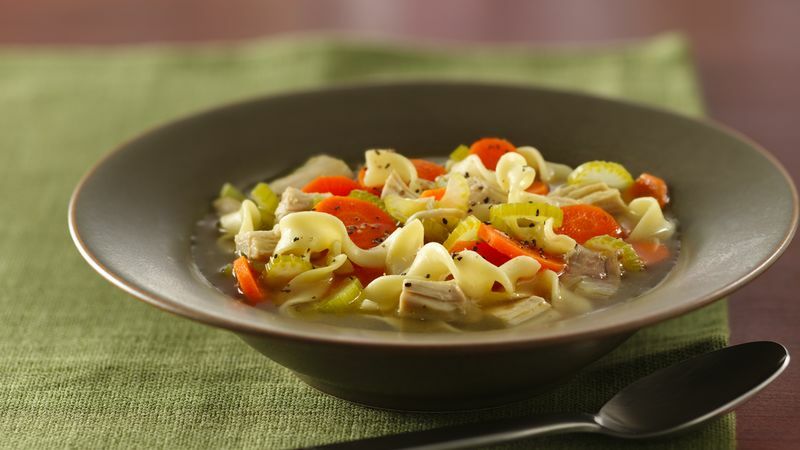 Start with 3 cups canned chicken broth and 3 cups cut-up cooked chicken or turkey instead of making the chicken and broth. Leave nothing to waste. Three to 3 1/2 pounds of chicken necks, backs and giblets (except liver) can also be used to make broth.